A couple weeks ago we processed nettles that we had collected earlier in the term and used them to make cordage. It was surprisingly easy. To process the nettle we split the dried stalk and flattened it a bit, then snapped and pulled off small (an inch or three) sections of the inner wall from the fiberous outer material, working up the plant until all that's left are the fibers (being particularly careful around the joints of the stalk). Then we buffed the fibers a bit by rubbing it back and forth in our hands and carefully removed the chunky bits that tend to occur around the joints. With the fibers processed we were ready to make cordage. The technique we used is called the reverse wrap. Taking two groups of strands you hold them from the end (or fold a group of strands in the middle and use the two halves), take the top bundle and twist it away from you than wrap it under the bottom bundle and repeat (now with the bundle that was originally on the bottom). The idea is that the twisted fibers are going against the direction of the wrapping so they won't unravel on their own very easily. You can also do reverse wrap with more than two bunches using the same process of taking the top one, twisting it and moving it to the bottom. 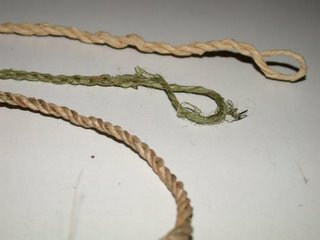 I made the top cord with some arts and crafts grass that the instructors gave us to practice with, the second cord is out of a stalk of nettle I processed and the third is a triple reverse wrap using strands of cattail. I was able to break the cattail cord with a fairly strong pull. Pulling as hard as I could, I was unable to break the grass or the nettle cord, though with two of us pulling pretty hard we managed to break the nettle (we didn't try that with the grass). The top/left track is from the cougar that I was wrote about on the first. The bottom/right track is from the dog we were out with (a medium-large mutt). Though the picture isn't great for details, I can clearly see two of the major cougar vs. dog differentiators and can sort of see two others. I've pretty much stopped counting how many friction fires I have achieved, but I haven't stopped practicing. The other day I tried out a new technique - I spun the hand drill while my roommate applied pressure with a handhold. We got a coal in no time. On the other hand I tried this morning at school (where we were basically outside so the temperature and humidity were less favorable than in the house where I'd done it before) and got some smoke but broke two spindles without getting a coal. So more work to be done before deciding how useful the technique is. A while ago my brother asked me how it was that I was struggling with starting a fire by lighter but was being successful with friction fires. There are a couple of parts to the explanation. First is that I've mostly practiced friction fires inside with nice dry tinder bundles and kindling, while my attempts at lighter fires are outside - generally with damp everything. The second part is that in some ways it is easier to get a fire started from a coal than from a lighter because a good coal can dry out damp material around it and continue to supply heat until it flames up (though obviously the dryer the material the better.) With a lighter it can be difficult to apply even heat for long periods (I've had a couple lighters break on me because I kept the flame going for too long). During the trip described in my last post Matt and I decided to try making a fire while out on our bike ride. He was skeptical that we could get a friction fire going, but I took that as a challenge and we scavanged a kit together. We even scavanged some twine to use as the bowdrill cord although it didn't take too long before we replaced it with some that he had brought with him (the twine had a strong fraying tendency). We tried the partner bowdrill method with big leaf maple on big leaf maple and later with doug-fir on big leaf maple (both of which I've had success with at home). We didn't manage to get a coal with the partner method, I think that the bow was a bit too long an unwieldy (I'd chosen a long one with the partner method in mind, but I guess should have stuck with a normal length bow). We tried for quite awhile, but eventually gave up as our arms got tired, our feet and hands continued to get colder, and our cord broke. We then tried for awhile to get a lighter fire started. We began by trying shavings from the big leaf maple. Matt was able to get single shavings burning, but never managed to get a critical mass going. While messing around with the big leaf maple sticks we had I noticed that I was able to pull off good strips of thin inner bark, much of which had remained dry (though only on some of the branches). That seemed like it would make good tinder, so I got as much of it as I could and split it up a bit into narrower strips. Matt was getting ready to start back because of the cold, but I wanted to make one good try with the inner bark, and sure enough it lit and started burning well. It did the second time anyway. The first time the flame was too close to my fingers so I dropped the bundle and it spread apart too much. The second time I held the bundle together with one of the longer shavings. We then used the shavings and some twigs to get the fire going and ended up staying there for another hour or so enjoying the fire and eating lunch. It's snowed a couple of nights in the past few days. On Wednesday morning I went biking with a friend from school. We were interested in checking some trails out that we'd hiked on previously and figured we'd cover more ground on bikes. Part of the way through we ran into a community schooler (Wilderness Awareness School's high school age program) and shortly after that we came upon some cougar tracks (from the previous night or the morning) with a bunch of community school tracks next to them. We trailed the tracks for a couple of miles along a logging road before running into a new group of kids and their leader. They had taken a break from trailing the cougar to try and build a fire in the wet woods. We talked to them for a bit and they told us that they had just heard on the handheld radio that one of the other groups had found something really cool, but it wasn't clear what. 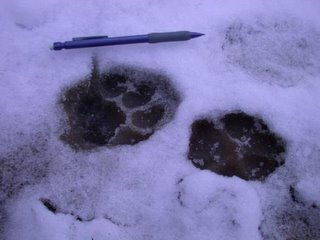 We continued on up the hill a short ways before seeing another bigger set of mountain lion tracks coming across the road. We looked up in the woods to see if we could trail that cat, but it was difficult in the duff. I did find a bird kill though, it was laying there - a bunch of feathers with a gut pile sitting on top. I'd never seen a kill site with a gut pile before, so that was interesting. I'm not sure what the bird was but I would guess it was around grouse size. After that we kept on up the road and didn't watch as closely for the cougar tracks and the next time we stopped to look for them they were gone. We thought that maybe the first one had left the road around the same place where the second one crossed. A couple miles later we stopped and built a fire (but that's another story), then headed back for home. The friend lives with two of the community school intructors so after we got back home he called me to let me know what the cool thing was that they had found. Turns out some of the students had backtracked the cougar a short distance from where we picked up the trail and found a dead buck that the cougar had been eating on.